This newspaper clipping features a photograph of an April 23, 1941 peace assembly at City College's Lewisohn Stadium. An annual event, the college administration cancelled all classes that day between 11am and 12pm to accommodate the gathering. With the main theme being "to keep the United States out of the war" and "to guarantee that CCNY shall not be America's War victim no. 1," attendees also protested the ongoing Rapp-Coudert hearings that saw to the suspension and dismissal of campus faculty and staff for their alleged communist ties. Speaking at the event was Canada Lee, a renowned African-American actor of stage, screen, and radio, who would later be blacklisted for his political affiliations. Creator | Eisendrath, David B. 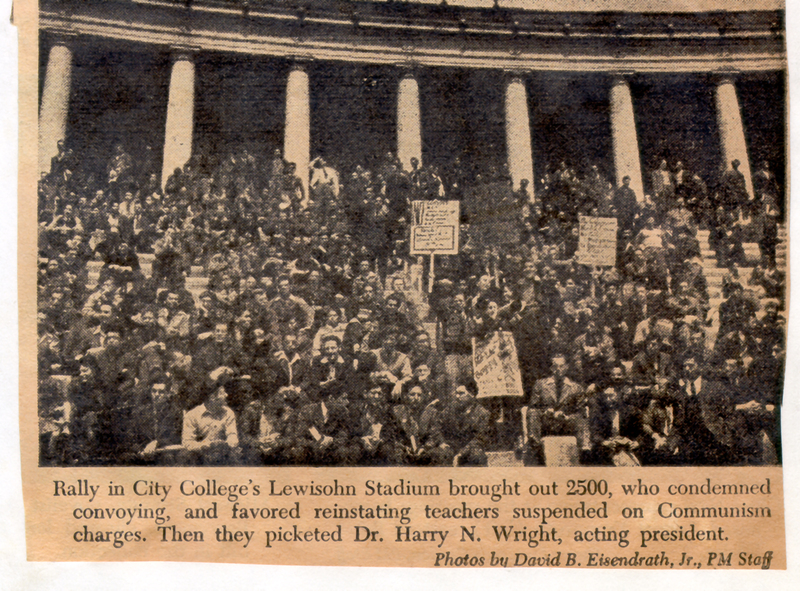 Cite This document | Eisendrath, David B., “"Rally in City College's Lewisohn Stadium",” CUNY Digital History Archive, accessed April 25, 2019, http://cdha.cuny.edu/items/show/3832.